A variety of tops for the most demanding of customers... from Global Upholstery! 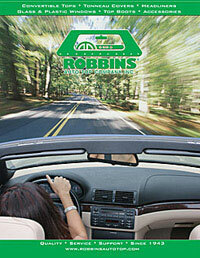 Robbins began manufacturing convertible tops and tonneau covers, concentrated on making for European models, since it was difficult to obtain high quality convertible tops in the U.S.A. for these convertibles. In 1985 Robbins began to manufacture convertible tops, glass and plastic rear windows and other for American built convertibles. Three generations of the Robbins family have owned and operated Robbins Auto Top Company, Inc. since its founding in 1943. In April 2001 Robbinsmoved into their new 53,000 sq. foot building in Oxnard, California. Click on the Robbins Logo to select a top from their Website. Based on its rapid expansion in the past decade, E-Z ON Auto Tops, Inc. has been recognized as the world's fastest-growing manufacturer of replacement tops for both domestic and import cars. Since its founding in 1989, E-Z ON Auto Tops has flourished through providing customers with the highest quality customer service as well as excellent fitting tops at very competitive prices. Dollar for dollar, E-Z ON's convertible tops have been proven to be the industry's best value.